You can fill out an application to receive notifications on available "Triple Defense Shield SPF50 Sunscreen PA+++". In stock more 10 109 pc. A revolutionary, highly protective sunscreen. With a satin, lightweight texture that dissolves rapidly into skin. Formulated with Idebenone, the most powerful antioxidant & Thiotaine. Offers triple protection against the visible signs of damage caused by UVA, UVB & IRA rays. Improves existing sun damage like fine lines, wrinkles & discolorations. Boasts a unique built-in brush applicator for more even coverage & optimal protection. Leaves skin suppler, sleeker, brighter & healthier looking with a matte finish. Gives good coverage and glow. Tried this for first time this year: slightly sticky on application, but goes well under makeup or on its own. And - more importantly - it works. Use with prevage serum. Great combination under makeup for day wear. Love the brush.. Spread the cream to the face evenly. And the aoplying is like a short massage. Great product. I bought 6 when there is good promotion. Perfecta. Es una combinaciСn de crema y protector. Yo uso el serum prevage y luego el protector y me queda la cara perfecta y protegida. Se da muy bien con la brocha incorporada. Prevage Triple Defense Shield. 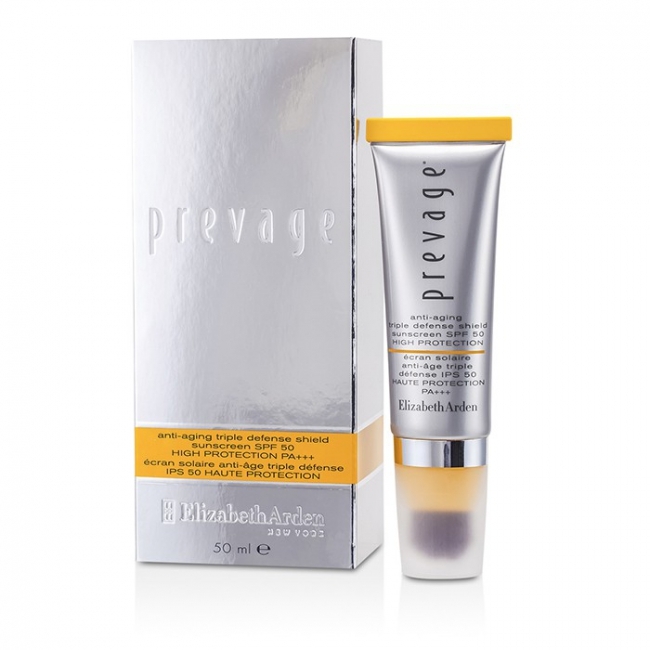 The Elizabeth Arden Prevage products are excellent - however this one I would not purchase again. It didn't provide me with the moisturizing qualities I expected so I have returned to the other Prevage products that carry a slightly higher price tag. Triple Defense Shield SPF50 face sunscreen. Absolutely the nicest product to use on your face with the best sun protection SPF50 and moisturising. Especially good for sensitive skin and does not clog pores. A bit expensive but worth it.